Lately I've gotten into the habit of thinking about my children--not children I have right now, of course, but the ones I hope to produce someday. Except less about the actual kids themselves and more about the material items I intend for them to inherit, items that will provide them with both a rich family history and tangible keepsake of A Mother's Love. In January, when Luke and I ordered pictures from Dan and Samantha's wedding, three wallet-sized orders were placed for pictures featuring the two of us, the newlyweds, and my entire family specifically for inclusion in Amelia, Lucy, and Nathan's baby books. When Luke's brother and sister-in-law offered us prints from their daughter's first-year photo shoot, I requested four; one five-by-seven for framing and three wallets for possible scrapbooking projects. In both scenarios, three seemed like a good number because that is the maximum capacity I've set for my womb, and naturally the best representation for that would be two girls and a boy because I'm better with girls' names. Even the possibility of a fourth throws all my plans out of wack, because THAT kid would have to steal my five-by-sevens and therefore come across as Mom and Dad's favorite. Perhaps the others could be appeased with Mommy's old diaries--who WOULDN'T be excited to know that the woman who gave them life used to make herself throw up? 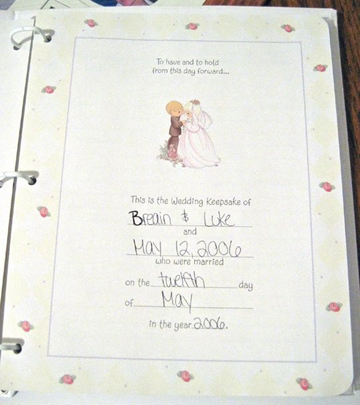 Anyway, last night was relatively tame for Luke and me, so I figured it was about time to start filling out the engagement book we received from the wonderful Lost A Sock at the beginning of the year. I imagined myself writing pages about the start of our romance; pasting in photographs from our formative days; transcribing sage advice from family and friends who know us best. That is, until I actually put pen to paper. Then I was all, "Mommy is a freakin' idiot." My first mistake? Messing up the "B" in my non-Internet first name. THE FIRST LETTER, people, and I had already doomed the entire book. In my signature B--as in signature standard, not signature hand-writing--the two vertical buttocks are interlocked tightly together with a perky little loop similar to that of a bunny-eared shoe lace. However, this B was wildly out of control, as if each buttock were experiencing some sort of hive-inducing allergic reaction to the other. To make matters worse, I have the brilliant notion to fix the B by tracing over it several times, which not only doesn't bridge the gap but instead plumps up the right vertical buttock, which is just plain embarrassing to the left one. It's as if the pen was possessed with the penmanship of a nine-year-old boy who sees dead people. Anyway, I'm disheartened but determined to press forward with the Creating of the Special Memories. The middle of the first line is divided with an "and," so I write our names in the appropriate spaces, tossing in an ampersandish symbol for good measure. I get to the second line but can't figure out what it's for, so I scribble in our wedding date. Then I get to "who were married on the ____ " and the lightbulb goes off, and I shout, "Aw, f*&^." 1) Invest in a bottle of white-out and get cracking so that Amelia, Lucy, and Nathan don't think their mommy is an idiot who can't follow even the simplest of instructions. 2) Buy a new copy of the journal and start over, because everyone deserves a white-out-free engagement book. 3) Leave the book as is and spend the rest of my life making it up to them. I remember when your mother wrote your name over and over on a piece of paper just before you were born, with different spellings and middle names-and different B's!Maybe you could just tell them you were just trying a different B.
I say just use the White Out. If the page was another color then white I would say get a new one but since it is white use a ew White Out bottle an call it a day. Any of our children will clearly be able to see that is Mommy's handwriting. Anyways, there's also option No. 4, it's a looseleaf page and can be replaced, leaving no one but the Internet the wiser. You're too funny! Leave it alone, it will be ok. In years to come you will open your book and roll your eyes as you pass the first page, and your kids will say, "Nice, Mom." And it will be fine. Orrrr - head over to the Hallmark store and heist the first page out of another book, eh? Eh? Then your children will not know that you messed up your writing...though they may know that you served a prison sentence for stealing if you get caught. I was going to say just replace that one page if you can. But, I don't know if that's an option. I have never laughed so hard about someone describing a "B"
whenever i mess up something like that, i always go the sticker route. just find a sticker of some sort that's large enough to cover your mistake. ps - if my word verification doesn't cheer you up, i don't know what will. "foybi"!! I would do the tape white-out. If that doens't look good then buy a new one. How is it that these choices seem unbelievably dumb but tremendously important all at the same time? I LOVE THIS SO MUCH. This is the best post ever. And I love that you have pictures to prove it.